In my previous post I talked about replacing my Canon ink jet printer with a new Brother laser printer. 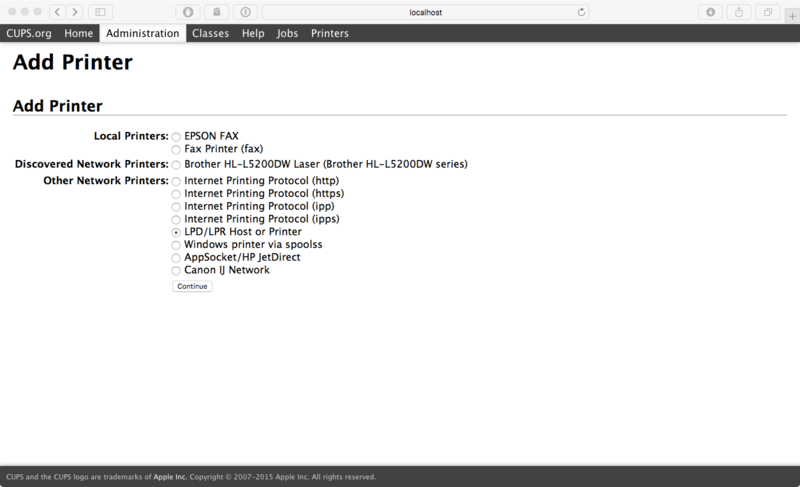 This new printer has two emulation modes that peaked my interest: Epson FX emulation and IBM ProPrinter emulation. Having used Atari 8 bit and 16 bit (ST) computers in the 1980’s with a large amount of my printing done on Epson compatible printers, I decided the Epson FX emulation in the Brother HL-L5200DW needed a deep dive. The goal was simple – get a printout generated by an Atari computer to print on the laser printer, not a PDF, a physical copy, complete with all the jagged-ness that accompanies a dot matrix printer. 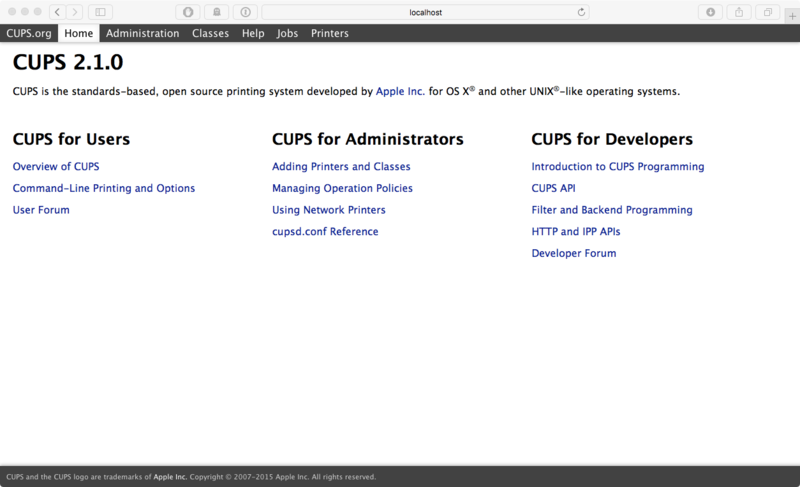 Next the CUPS printing system needs a new printer definition. 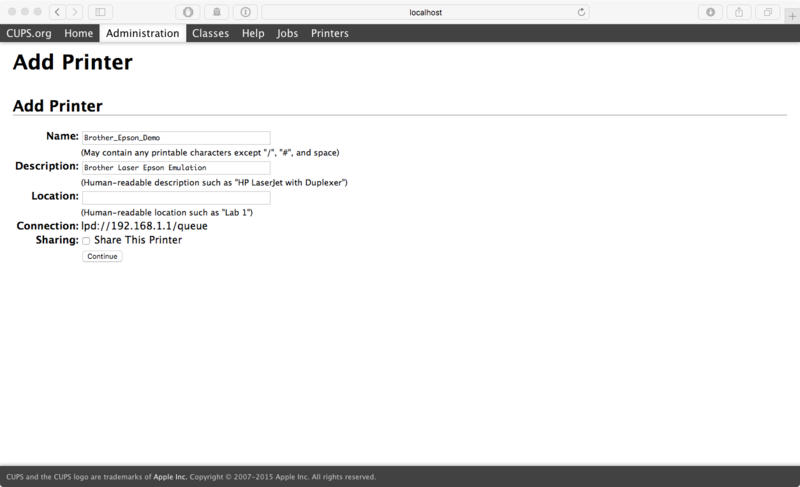 This new definition will be set as a raw device, and will be configured to use LPD. You may have luck using one of the IPP configurations as well, but the LPD method works reliably. For my purposes I used Atari emulators running on OS X. The emulators provide a way to capture printer port data to a file, thereby allowing the Atari computer software to use their own “printer drivers”. This results in a binary data file containing all the data that would have been sent to the printer, in other words, a raw printer file. If you have ethernet connectivity from the Atari, you may even be able to print directly to the networked printer. The ST should be easier to do than the 8 bit. I will figure this out once I get an Atari (8 or 16 bit) connected via ethernet. It is unlikely I will ever get an 8 bit connected via ethernet, though it would be cool trick. For the Atari 8 bit using Atari800MacX, I could have just printed to an emulated Epson FX printer and saved the output directly to PDF, then printed the PDF. But what fun is that? 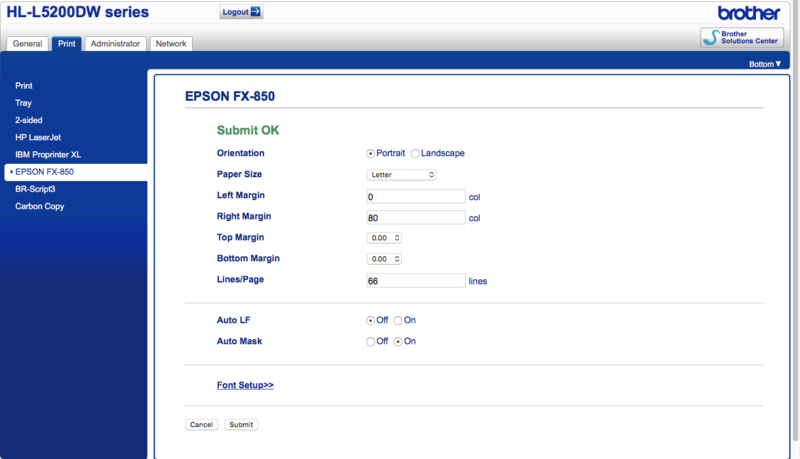 I want the printer to raster the page from the Epson FX commands, not a software engine. If the program you want to print from can print directly to a file, such as many word processors, do that. But don’t do it as plain ASCII, do it using the printer codes/driver. Once you have the output file on either an ATR (simulated floppy disk) or simulated hard drive, copy/extract the output file to the Mac’s local filesystem. Now skip ahead to “Dump Output File” below. 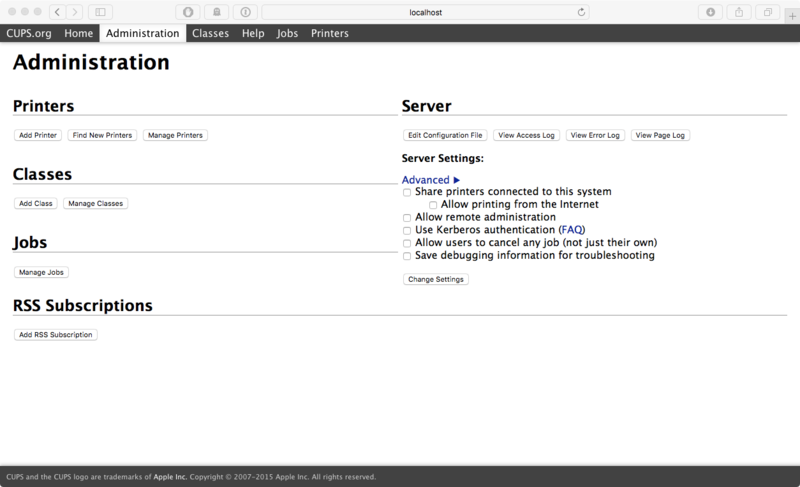 If the program you want to print from can not print directly to a file, then the Atari emulator needs to be setup to capture the printer output to a file on the host computers local filesystem. For Atari800MacX, set the printer to Text. The output file will contain all the binary data even though its a “text” file. The printer type should be called “File” not “Text”. For the Atari ST, simply configure the emulator to send all printer data to a file. 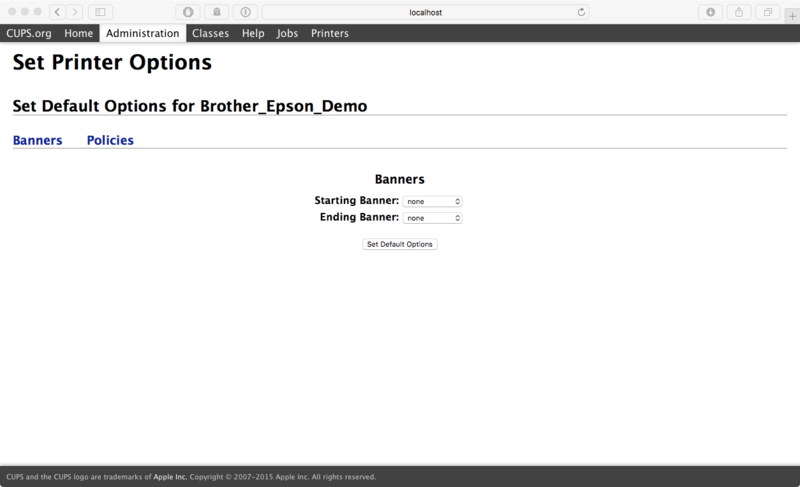 Then configure each program you want to print from to use Epson FX printer codes/driver. After each print, simply collect the file. 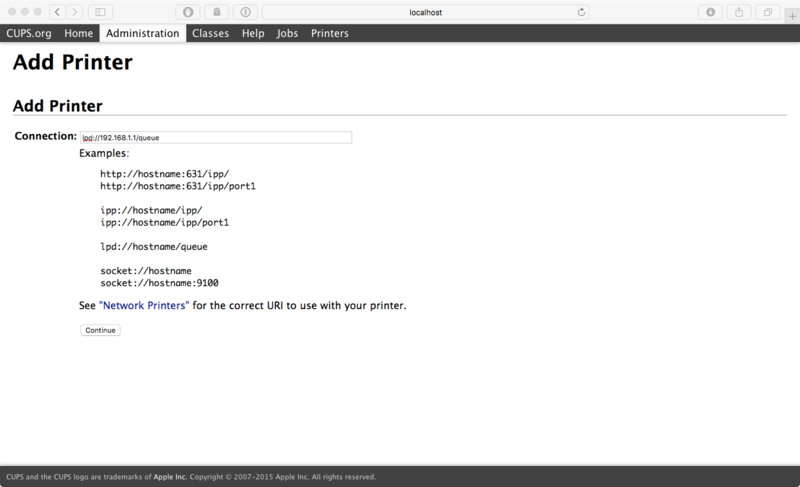 When using Hatari, the default printer output filename will be “hatari.prn”. With the file collected skip ahead to “Dump Output File” below. 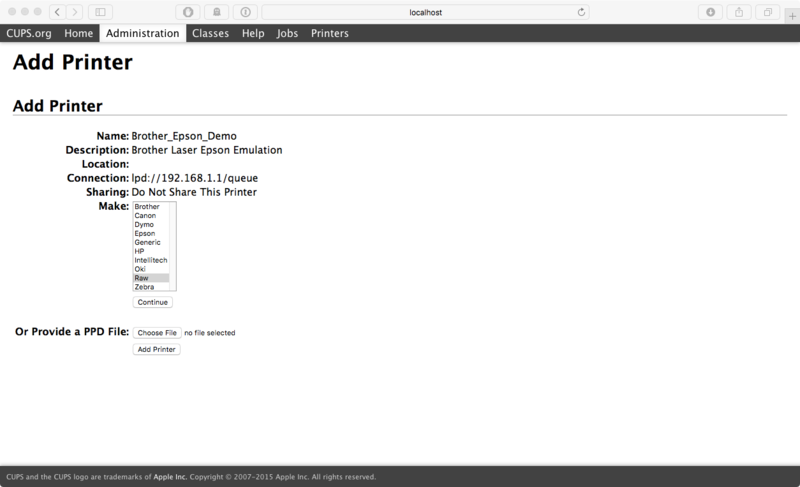 Now you should have a printer output file ready to be sent to the printer. If not, go and create one, then come back here. 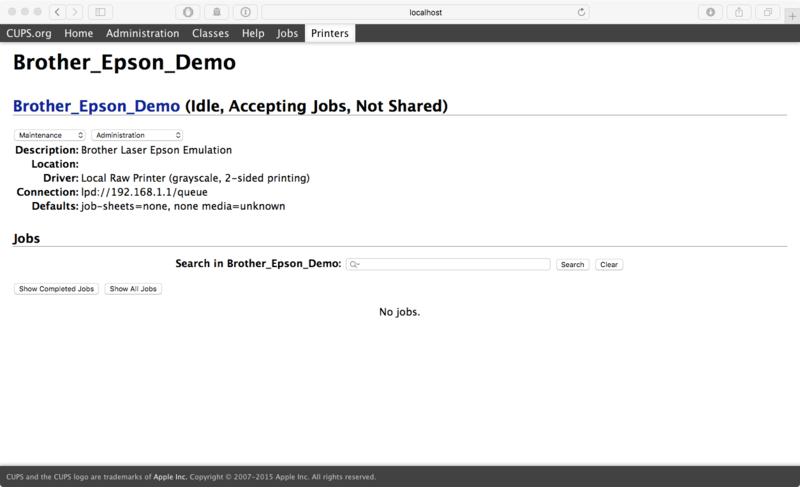 Open Terminal and change directory to wherever your printer output file is. Wait a few seconds and the Brother laser should spit the page out in all of it’s simulated dot matrix glory. Now instead of worrying about worn ink spots in the printer ribbon you can worry about low toner and bad drums. For the last several years I’ve had a Canon MG-6120 color ink jet printer. The print output quality is incredible. However, it chews through ink wells just about as fast as you can replace them. During ownership there has never been a time when at least one of the ink wells has not been “low” or needing replacement. Canon cites a ~450 page yield for cyan, yellow, and magenta, and pigment black at 328 pages. Grey is better at 1515 pages, and normal black at 2185 pages. During the time I’ve owned the printer, I’ve gone through two reams of paper (1000 pages) at most. So, I don’t print a lot, and never ever print photos. The Canon page yield seems closer to 50 for the color ones, and the grays and blacks showing about one fourth of their stated yields. As you can see, even at the maximum yield, this printer is quite expensive to run with cost per sheet between 3 and 5 cents. I’ve grown tired of constantly replaced one ink or another, and having to wait 30+ seconds before it decided to print. Recently after replacing yellow at $14, and a week later needing to replace magenta and cyan (with basically no color printing occurring), I bought a tri-color refill for $46 (post taxes). I was so disappointed that I returned it within two days. I thought about my need for color, and weariness of constantly filling inks. I knew there were monochrome lasers available for under $100 so I started looking at replacements. Using the same cost breakdown as the Canon above, I created breakdowns for many laser printers, both monochrome and color. I ruled out the color options after carefully considering the amount and type of color printing I do. I can get by with black and white just fine. On those few occasions I need color, I can take the document in PDF format to local pharmacy and have it printed for relatively cheap. I had several criteria a new printer had to meet. The top three of those are duplex printing, AirPrint support, fast time to print. 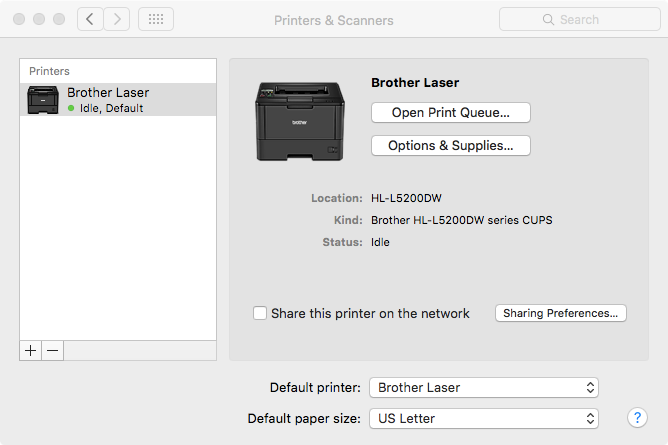 I previously used Printopia on my Mac to offer AirPrint for the Canon printer, but that means the Mac has to be awake for it to work. I wanted to eliminate that as well. The breakdowns include a standard yield toner, high yield toner, and image drum. I computed the cost per page for each, then added the image drum cost per page to each toners cost per page to come up with a total cost per page. 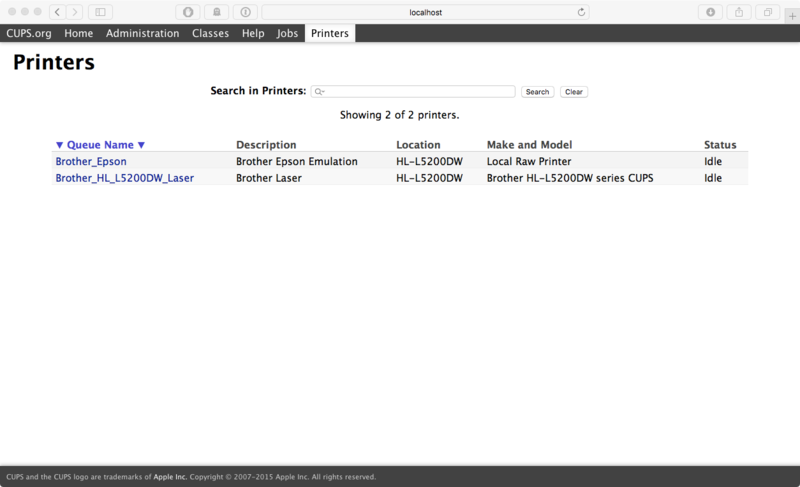 Both of the Brother printers offered excellent total cost per page, with the SOHO business unit (HL-L5100DN) coming in at 1.7 cents when using the high yield toner. The Brother HL-L5100DN also has a few additional features I was interested in. Primary is duplex printing. 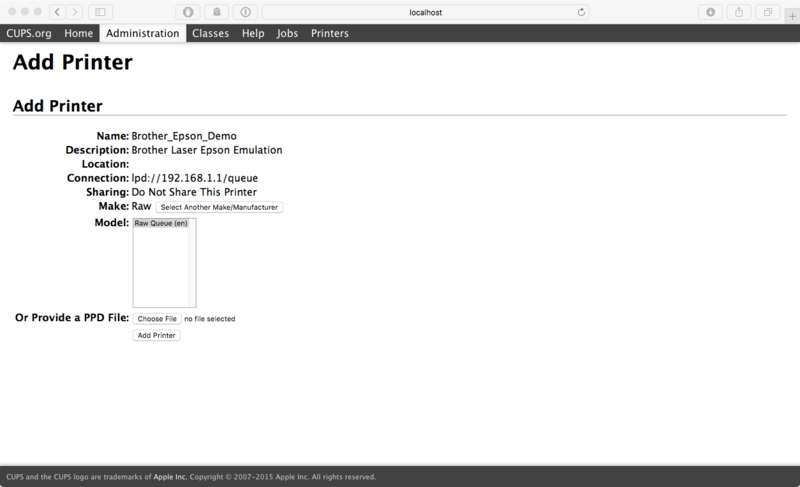 Secondary, is Epson FX and IBM ProPrinter emulation. As an avid Atari computer enthusiast, being able to print to the laser using the emulation is a nice benefit, and in fact I will cover this in the next post. Tertiary is the fast time to print. The HL-2380DW has a first page print in 8.5 seconds, while the HL-L5100DN is 7.2 seconds. In addition to the consumables cost I also looked at printer memory sizes, power consumption, and noise (db level). For about $20 more the Brother HL-L5200DW offers wireless printing, and comes with a standard yield toner instead of a starter toner. I went with this printer. With a 3000 page yield on the toner and 30 page yield on the drum, I shouldn’t need to replace either for quite some time. It arrived 2 days after placing the order with a favorite online retailer. Setup was easy. And one thing I was extremely happy with is that the driver installation installs JUST the driver and not a bunch of crapware I don’t want or need. Yay Brother! The only complaint I had during setup was the firmware update. There were two firmwares to update (a primary, and a sub), which required two update cycles. Each update reset the network configuration, necessitating network password entry three times. Output is crisp and clear. After printing the Brother test page, I test printed various documents and a picture. As expected the picture was less than stellar with only grayscale, but I don’t do any photo printing, so this was just a curiosity more than anything. All other documents were extremely clear using the 600 DPI setting (default). I haven’t tried using the 1200 DPI setting yet. I also tried AirPrint and it works flawlessly. One I had all the modern computers and devices printing to the new Brother HL-L5200DW, I wanted to get an Atari’s output to it. After a few hours of various configurations I did get it to work. I’ll explain how next.